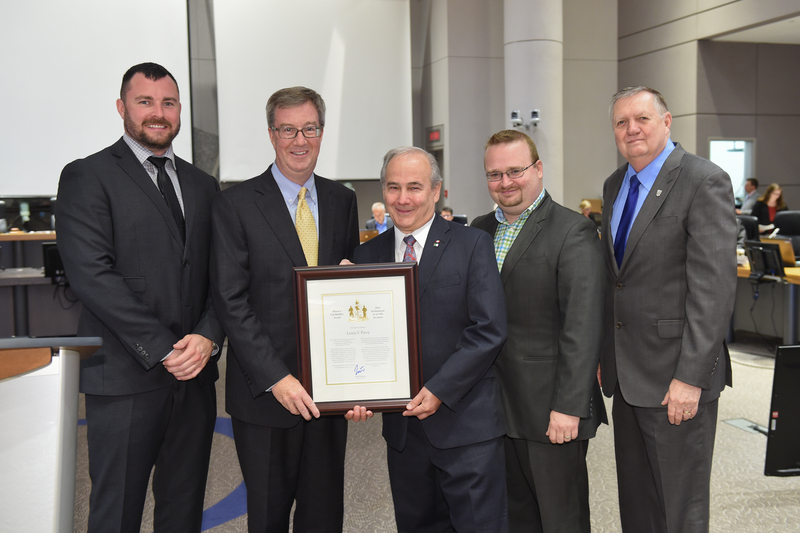 Mayor Jim Watson and Innes Ward Councillor Jody Mitic presented the Mayor’s City Builder Award today to Louis V. Patry, recognizing more than 35 years of volunteer work in preserving and promoting the history and heritage of Orléans. In 1968, he was the first bilingualism policy advisor to the Office of the Auditor General of Canada. The first French cultural shows offered by MIFO in the early 1980s were organized by Louis and his team of volunteers. The popular program continues today at the Shenkman Arts Centre, with more than 8,000 tickets sold in 2014. In 2011, he created and served as the chair of the Comité pour l’amélioration de la place des noms francophones d’Orléans (CAPNFO), a SFOPHO committee that raised awareness about the importance of using French accents on French words in names and titles of public places, notably the accent on the “é” in Orléans. As a member of the Mayor’s working group to update the City’s Commemorative Naming Policy in 2011-2012, he researched and wrote a paper on commemorative naming policies of various provinces and major cities. At the request of the Gloucester Historical Society, he wrote a history of Orléans, which is available on the SFOPHO website in both languages. Louis’s contributions have helped make the SFOPHO a vibrant and active organization dedicated to preserving and promoting the Francophone heritage of Orléans and Ottawa. As the SFOPHO is the only Francophone historical society in the Ottawa region, it is often called upon to represent the French-speaking community of Ottawa with regard to heritage.